We LOVE technology. So when CES rolls into Las Vegas each year, we pay very close attention. If you want to know what game-changing innovation is set to make a big splash the consumer market in the coming years, then look no further the annual Consumer Electronics Show. Bummed out you had to miss the Intel keynote? Don’t worry, we sifted through countless featurettes, showroom videos, and press releases to bring you our favorite gadgets and gizmos straight from the showroom floor! Self-driving vehicles are going to play a major role in modern society for the foreseeable future, and a lot sooner than some people might think. If you’re wondering what the implications are of this new and promising technology, look no further than Toyota’s e-Palette. While most eyes are focused solely on autonomous consumer vehicles and getting the average joe from point A to point B, the e-Palette gives us a glimpse into what our street corners might look like in the coming decade. This all-purpose mobile station can be used as a storefront, food truck, people mover, rolling advertisement, or really anything one could imagine. The fully electric vehicle will come in a variety of shapes and sizes, depending on the model and the application purposes of your mobile station. One of the more interesting concepts displayed during the presentation was a mobile hotel suite which allows passengers to actually sleep in the vehicle, combining a shuttle and a hotel room all-in-one. While Toyota doesn’t yet have a mass production plant setup to produce the concept, they are planning a test run of a small fleet at the 2020 Olympics games in Tokyo. 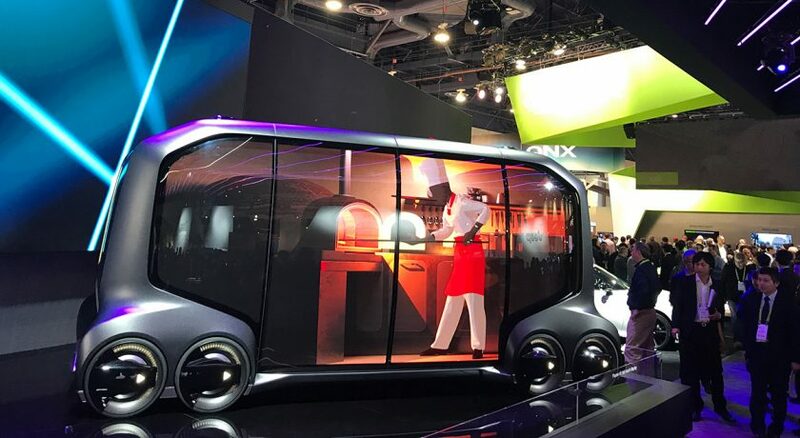 Pizza Hut, Amazon, and Uber have all expressed interest in partnering with Toyota on the project, and Toyota is adamant that this is much more than the typical concept vehicle we see at CES each year, most of which never see actual daylight. It will be very interesting to watch this project develop over the next few years, and don’t be surprised if your future self is already picking up their pizza box out of an E-Pallette. All the way back in 2016, in a similar post-CES roundup article in this very same blog, I featured LG’s 18 inch rollable 4k display as one of the highlights of the show. Seen as a novelty and a pipe dream at the time, fast forward a mere 2 years later and LG has pioneered that same technology into a fully functional 65 inch display. It’s impossible to put into words how beautiful this display is, with most attendees using the word “magical” when asked to describe this mind-blowing television. The benefits of a rollable screen are obvious: lightweight design and ultimate portability. Essentially you would be able to take your 65 inch display to the office, a party, your friends house, vacation, you name it. The box itself, seen at the bottom of the image above, also doubles as the “rolling” mechanism. This allows you to change your screen size, or hide the screen altogether with the touch of a button. While certainly a marvel to behold, there are still a lot kinks LG will need to address before releasing to the consumer market. The set has no tuner, HDMI inputs, audio components, or any of the other essentials that are standard in most of today’s modern television sets. If they hope to produce a consumer-ready product they’ll have to find a way to incorporate those necessities into the bendable screen, which will probably involve wiring all the inputs into the box. Nevertheless, LG is adamant that they are bringing this tech to consumers soon, so maybe in a couple years I’ll be able to do a follow-up piece. With everyone producing “smart” home products these days, Kohler has decided to capitalize on the growing market with an entire series of TIOT connected bathroom and kitchen appliances called Kohler Konnect. 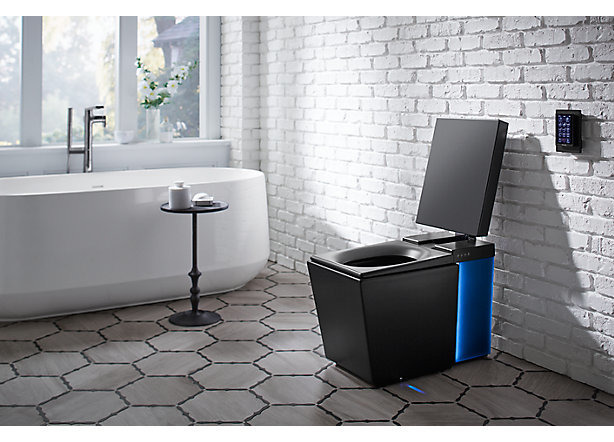 Normally toilets and bathroom mirrors aren’t much to get excited about, but the futuristic designs and practicality of Kohler’s new line of products were turning heads on the showroom floor. The booth showcased a number of new additions to the Kohler family, including a shower, mirror, sink, bathtub, and two different toilets, all of which come equipped with Alexa voice command and a variety of somewhat over-the-top features targeting consumers with a propensity for the luxurious. For example, the Numi intelligent toilet has sensors which detect owners approaching and automatically warms up the seat and footrest, perfect for those cold winter mornings. Perhaps the most useful of these new additions is the Sensate faucet, which can change to a specific temperature, or pour a specific amount of water, all using the Kohler Konnect app or via voice command. While the price points will give you anxiety, consumers looking for the latest in tech in bathroom comforts can find these products available for pre-order sometime next quarter. 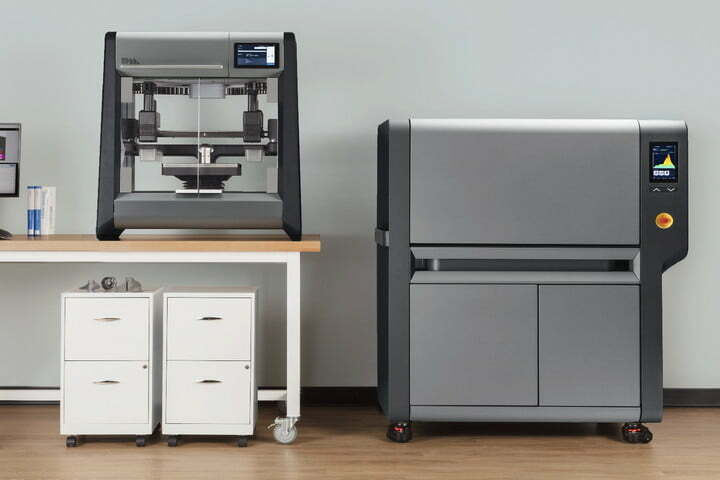 3d printers have been prominently featured at CES for a few years now, but this year Desktop Metal stole the show with their DM Studio System. What sets these apart from your traditional 3d printers is their unique ability to print custom objects out of common metals like steel, copper, titanium, and aluminum quickly and without a mechanical engineer running the machine. The model on the right in the picture above is called their “desktop” version. While it dons a hefty price tag at $120,000, the capabilities of this machine are truly staggering. The company claims they are able to produce designs 100x faster, and 95% cheaper than anything currently available on the market, which they attribute to Single Pass Jetting technology. SINGLE PASS JETTING DELIVERS SPEEDS UP TO 8200 CM3/HR–100X FASTER THAN LASER-BASED SYSTEMS. WITH ZERO-TOOLING NEEDED, IT’S THE FASTEST WAY TO MANUFACTURE COMPLEX METAL PARTS. For all of us that aren’t mechanical engineers, that essentially means that the machine has tens of thousands of jets that can output millions of droplets per second. The implications of this technology are endless, as its capable of printing anything from boat propellers to pots and pans. So, if you have a hankering for some metalworking, and an extra 120k lying around, this might be your hot ticket. Every year CES provides attendees with something that surprises everyone. This year, the absurdly adorable Aflac duck was tugging at the heartstrings of everyone that walked by the booth. 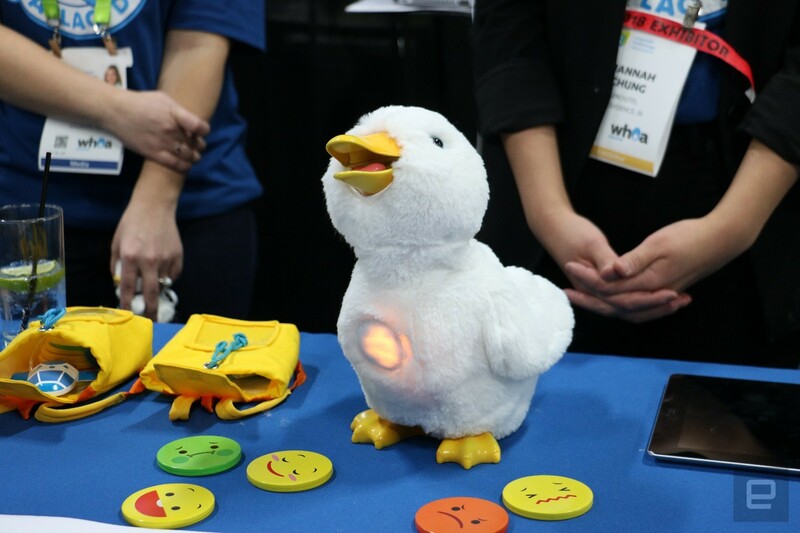 Teaming up with a company called Sproutel, Aflac has created a robotic duck meant to be a learning tool, communication device, and special friend to children afflicted with cancer. Functioning much like a Furby, the duck is filled with sensors and chips that allow the users to trigger a series of reactions by interacting with it in certain ways. For instance, give the duck a tickle under its wing and it will shake around and quack with laughter. But what makes this duck so special are all of the custom features built specifically for pediatric cancer patients. The duck comes with emoji coins that can be placed on the duck’s chest causing it to act like the corresponding emotion pictured (image above). Place the frowny face on the duck’s chest and it will react by lowering its head and whimpering. The toy is especially helpful for younger children that have difficulty communicating openly and effectively while undergoing chemotherapy treatment. The duck acts as their own sort of personal translator, and can even mimic the child’s speech patterns with quacks. There is also a port-a-cath equipped with an RFID chip that allows children to give chemo treatments to their new companion while they themselves are undergo treatment. The duck has been tested by over 100 children so far with spectacular results, and Aflac has stated they hope to get a duck to every single one of the 16,000 kids expected to be diagnosed with cancer by the end of 2018. Concussions and head trauma have been in the spotlight for a few years now, so it’s no surprise that we’re seeing a new wave of early detection and prevention devices meant to help make football and other contact sports safer for both kids and adults. Prevent Biometrics has been testing their new product in select areas for over a year, and it’s finally set for a consumer launch in the third or fourth quarter of 2018. The device is a fully functioning mouthpiece equipped with 3 accelerometers, an LED impact alert system, wireless syncing with the accompanying app, and built-in wireless charging. The mouthpiece alerts players and coaches when the user has had a significant head impact, detecting concussion and head trauma much more accurately than the field tests currently used in the minors and pros. With CTE and other traumatic brain injuries looming over major organizations like the NFL and UFC, this product may help to ease the minds of worrisome parents who have reluctance when it comes to letting their children play in physical and impact athletics. The standard one-size-fits-all model starts out at 199 retail, with a custom mold fit option available for only 100 dollars more. Everything from our phones to our refrigerators are “smart” these days, and Wi-Fiber is taking the hyper-connected blueprint straight to our city streets. 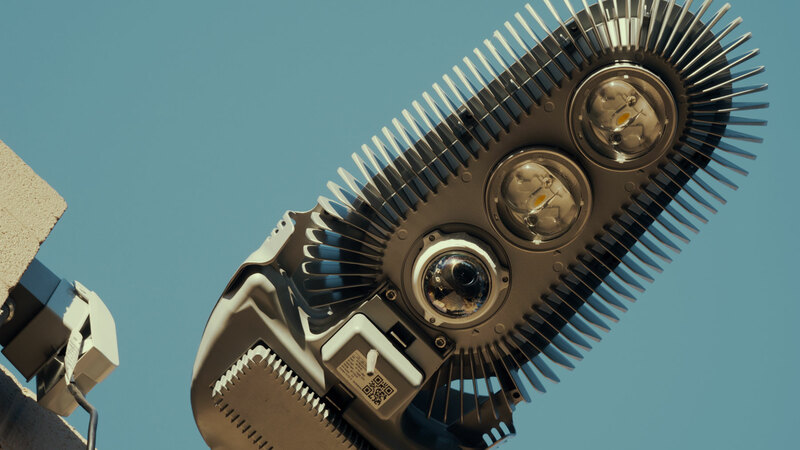 This modular streetlight is equal parts cool and creepy. It can be fitted for a variety of applications, the most obvious of which is an ultra bright LED light that will light up a wider area than a standard bulb and much more efficiently. These specialized bulbs are also able to strobe and change colors, a useful tool for highlighting areas for first responders in the event of an emergency. Also included as a modular attachment is a powerful wifi signal broadcaster, allowing the city streets to be their own networks and bringing high speed internet to swaths of city blocks at a time. This would have major implications for lower income areas where internet is a luxury to inhabitants, and would also severely cut down on cellular data usage for anyone in its range. Some of the features available were giving attendees pause however, as it is also able to be equipped with powerful 4k cameras and two-way microphones, even further enhancing Big Brother’s reach into our everyday lives. Compounding these fears is the announcement all captured data and footage can be archived and later searched, meaning access wouldn’t even require a warrant from authorities. Despite all this, the product does have some very beneficial offerings like gunshot detection, air quality monitoring, tornado warnings, and more. Like any piece of powerful technology the overall positive or negative impacts it will have on our society will likely come down to how it’s used, who controls it, and the intent of those that do.